Mrs. Park (age 82) lives in Sangju, a rural city in South Korea. She often likes to play go-stop, a Korean card game, with her friends down at the town hall. Yes, money is involved, but always just pennies. (FYI, this type of “penny-ante” gambling is legal in Korea.) One thing about Mrs. Park is that she is known on occasion to cheat and be a sore loser. One day, she loses pretty bad and ends up arguing with some of her friends. The next day (at the town hall), six of her friends are found lying unconscious, frothing at the mouth! (Lethal amounts of pesticide are later found in the cider aka Sprite bottle they had all drunk from.) Interestingly, Mrs. Park is also at the scene but is okay/unaffected. The police immediately suspect foul play. There is no direct evidence, but Mrs. Park is singled out as the prime suspect mainly because: 1) On the day of the incident, Mrs. Park took a different route to the town hall. On the way, she asked if one of her friends was already there, something she did not normally do. 2) Traces of the same pesticide were later found on many of her personal belongings. 3) An empty, capless tonic drink bottle later found around her house also had traces of the same pesticide. + The same type of cap to that tonic drink bottle was being used to cap the problematic cider bottle. 4) She did not immediately call for help even though she saw friends unconscious, frothing at the mouth. + When paramedics arrived, she did not seem very concerned. 5) Many of her statements just didn’t add up. Soon, Mrs. Park is indicted for murder and attempted murder. (Out of the 6 victims, 2 are dead.) She maintains her innocence and requests a jury trial. The court accepts, and trial begins. Can/Will Mrs. Park be found guilty? What is to become of her? The example situation is very similar to a case recently reported here in Korea: The Sangju Pesticide-Cider Case (상주 농약사이다 사건). FYI, the actual events took place last July in Sangju, North Gyeongsang Province. On December 11th, the Daegu District Court found her guilty and sentenced her to life in prison. (The jury unanimously reached a guilty verdict.) Mrs. Park has appealed the decision. Btw, the screenshot at the very top of this post was taken from an MBC TV program called Real Story, Eye. The caption reads: “Suspect Park appears in court.” But it’s incorrect to call her a “suspect” (피의자). 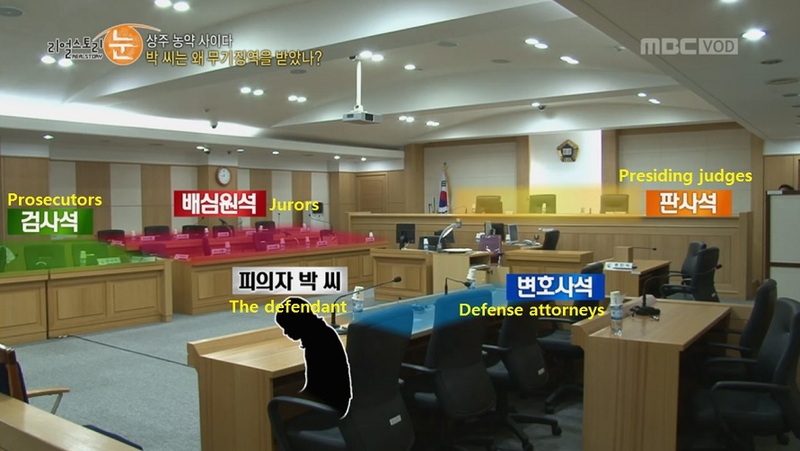 Once indicted, a suspect becomes a defendant (피고인). It’s either-or. I feel the defense has an uphill battle. They already tried really hard to cast reasonable doubt. They argued that the traces of pesticide on Mrs. Park’s belongings came from when she tried to help the victims and that she did not initially call for help because she thought they were all just napping. The defense also suggested the possibility that the real perpetrator (or the police) could have planted the evidence. (Why would Mrs. Park just leave incriminating evidence around her house like that.) More importantly, they argued that the motive (suggested) is not motive enough (to kill). They had all known one another for decades: So one day they argue, and suddenly Mrs. Park decides to kill them all the next day? FYI, the appellate trial will not be a jury trial. And even if Mrs. Park is somehow acquitted, the prosecution can still appeal that decision. In Korea, both guilty and not guilty decisions can be appealed. At any rate, I would like to express my condolences to victims and their families. I always think about whether there was something the victim(s) could have done. In this case, I really can’t think of anything. In Korea, “Murder” (살인) is a crime that encompasses the crimes of 1st/2nd-degree murder + voluntary manslaughter (in America). Factors such as “premeditation” or “heat of passion” are reflected in sentencing. After all, a murder is a murder is a murder. Murder Tidbit 1: The requirement for “Attempted Murder” (살인미수) would already be satisfied when a poisoned drink is intentionally handed/given to another person (with the intent to kill him/her). Murder Tidbit 2: In the last 15 years, there were 7,712 murder cases in Korea. Out of those, 7,439 were solved, while 273 (3.5%) turned cold. Starting last August, the statute of limitations for “Murder” has been abolished. It used to be 25 years. Note: This change did not affect murders whose statute of limitations had already expired.